When I spotted this book in a thrift store, I was intrigued first by the title then by the fact it was written by a Senator. 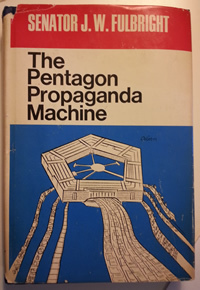 Although a relatively short book, The Pentagon Propaganda Machine by Senator J.W. Fulbright is an expose of the methods used by the various branches of the military in the 1960s to win the public over. Fulbright, of course, takes issues with the methods used and the money spent on those methods. He cites stat and stat and example after example of how ‘common folk’ and ‘community leaders’ were courted by military to persuade the public of the need for a standing army and a robust military infrastructure. Although, I doubt many readers were swayed one way or the other on military issues by Fulbright’s book — it does highlight some of the policies and procedures used to this day to influence the American public. One of the more interesting stories in the book, though, deals with John Wayne and his movie production company, Batjac — and the favors they incurred from the military when filming The Green Berets. The movie showcases the work of the berets in the Vietnam war and portrays the war in a favorable light. …Upon completion of photography, many truckloads of equipment, training aids, and material as well as a complete Montagnard village constructed at Company expense were presented to the Infantry Center for use in its guerilla warfare training program. Culmulatively, the donation can be evaluated at about $75,000, as estimated by Fort Benning officers, and will result in a significant contribution to the realism and effectiveness of guerilla training conducted at the Center. At that time, American troops had been in combat in Vietnam for more than two and a half years. If Fort Benning by then did not already have guerilla training facilities as good or better than those left behind by Wayne’s company there is something wrong with Army training. Rated: 4.5 out of 5. This is a quick read and an interesting glimpse at how public opinion was shaped in the 1960s.